The Predict-A-Foal™ Kit is a mare foaling predictor kit that will determine whether she will be foaling within 12 hours. Safe and easy to perform, the test kit is designed to test for levels of calcium and magnesium in the secretions/milk of the mare's udder. 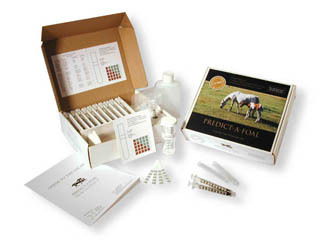 The Predict-A-Foal™ user guide educates expecting horse owners in detecting the signs of parturition, when to begin testing, a step-by-step guide to testing procedures and interpreting test results. Predict-A-FoalTM is the easiest to use foaling prediction system on the market. Each kit includes supplies for 15 tests and additional test strips can be purchased separately. 1. Prevents unnecessary sleepless nights. 3. Economical, especially when compared to night watchman or electronic monitoring device. 4. Allows safe and comfortable movement of mare prior to foaling. 5. Avoids the necessity of confining the mare to a foaling stall too early. 6. The test is safe, non-invasive, and reliable.